The academic program at TSCA is grounded in Proverbs 9:10, “The fear of the Lord is the beginning of wisdom.” All subjects must start with the Bible as God is the author of all creation. It is the role of every Christian educator to shape the worldview of their students using the Bible as the authoritative guide. The teachers at Twelve Stones Christian Academy (TSCA) teach all subjects from a biblical-worldview perspective and challenge students to think critically and biblically about every academic subject. The curriculum for TSCA is carefully chosen by our curriculum committee. They ensure that it is grounded in Scripture, apologetically sound, and academically rigorous so that it will equip the students with skills and knowledge to defend their faith, become good stewards of God’s earth, and be bold witnesses for Christ. 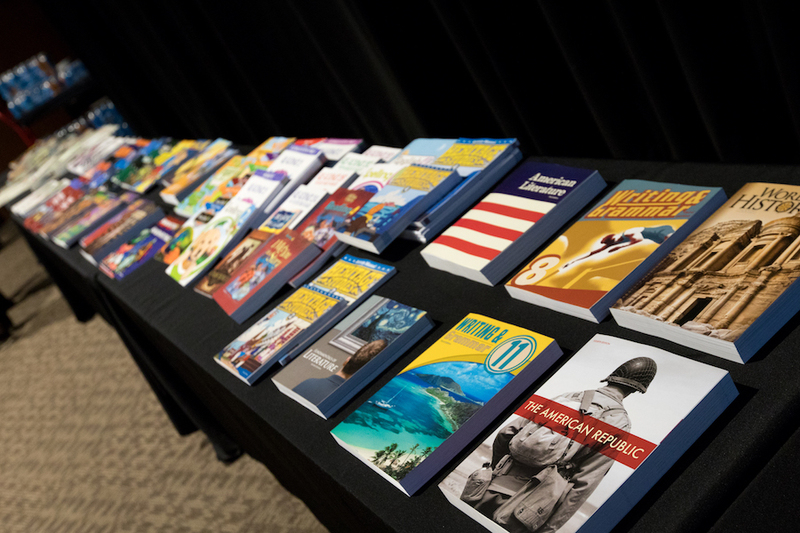 Many of the textbooks used at TSCA are published by BJU Press. We appreciate their biblical worldview stance and their consistency to look at each subject based on Creation, the Fall, and Redemption. In other words, these textbooks repeatedly look at subject material like literature, science, history, and so forth from a biblical viewpoint especially in light of the Creation Mandate, the Fall, and Redemption. This is especially important regarding science and history where the world is constantly attacking children with the false humanistic history of big bang, millions of years, and evolution. TSCA also supplements with Answers in Genesis and Master Books material which take a strong stance on the authority of Scripture. As kids learn the true history of what happened according to God's Word, they are better able to spot these common false claims and discern why they are wrong. These textbooks will also give students a chance to understand the nature of God and to have a deeper understanding of the world God designed for us that has been sadly marred by sin. Mathematics is a unique language in which we can study and express abstractions of the physical world using logic. Everything in our physical world has features that can be measured and studied. When we isolate one or a few features for study, we see a reflection of God's nature: consistent, orderly and logical. Only by the absolute standard of God do we have a basis to do mathematics. God gave us the ability to do math so that we may better understand Himself and His creation and to obey His command to have dominion. Science only works because God is upholding all things and promises to continue to do so. With God’s word we can understand geology in light of the flood, astronomy in light of Genesis 1, biology in light of God’s created kinds, etc. We also use science and the Bible to help us understand the past. Everyone has the same evidence - the same earth, rocks, stars, DNA, etc., but the difference is the interpretation of that evidence. There are only 2 choices: God or man. A biblical worldview is where you start with God and His Word to understand the evidence. If you reject God, then you are relying on man’s fallible ideas and using that as your basis for looking at the evidence - this is also called the religion of humanism which is sadly taught in the public school system today. History starts in Genesis 1:1, “In the beginning God created the heavens and the earth.” The Bible’s record of history is inerrantly revealed to us by a perfect God. It is the absolute truth and when the world’s rewritten history deviates from God’s Word, then it is that alleged history that is in error. We oppose the false views of history that is being articulated in our culture. False history like evolution, millions of years, and big bang are challenged with the truth of history that uses God’s Word as the foundation. English - where do languages come from? Language was created from God to communicate with Him, but now we have a diversity of languages because of what happened at the Tower of Babel. Language families left Babel with various family groups being put to written script, whether pictorial, alphabetic, etc. Then languages continue to change—adding words, losing words, changing definitions, changing grammar, tonal adjustments, etc., to arrive at the various languages we have today (about 7,000 of them). These subjects taught from a biblical worldview form a proper understanding of the world, and an education at TSCA stands boldly on these truths.